I like fish and fishing (deep sea bluefishing, specifically) and I like farms (are vineyards farms? ), so it made perfect sense to suggest going here when Dudeman and Shrink mentioned going out to dinner. Seafood. Farm to table produce (they even own the farm). What's not to love? 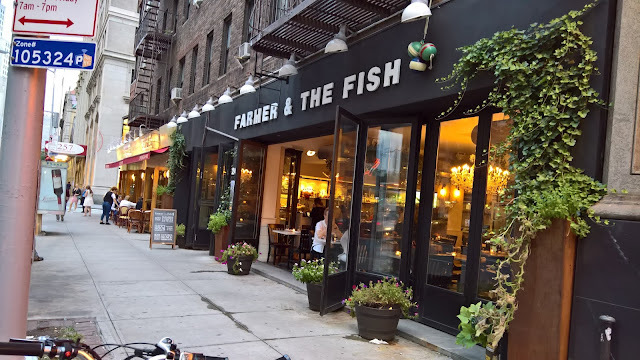 When I first walked past Farmer And The Fish, I wondered if they were going to get sued by the popular Philadelphia restaurant The Farm And Fisherman. I still wonder this. Will they exist by the time I publish this article? Time will tell. Probably. 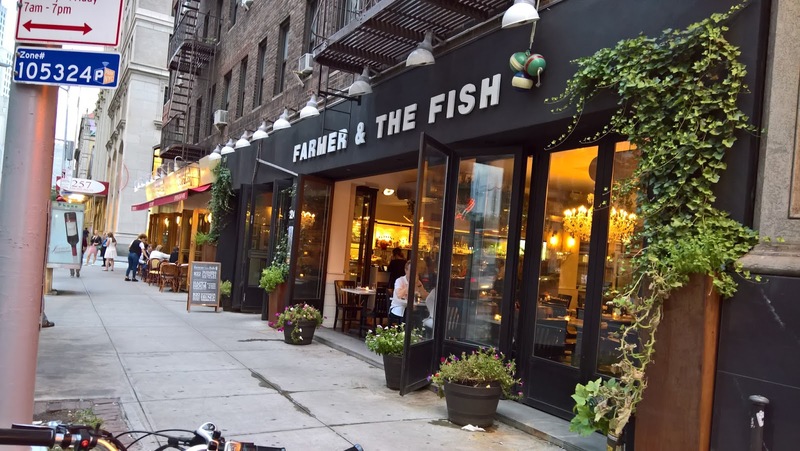 Farmer & the Fish sits on Park Avenue South near Union Square, right next to L'Express, the best place I know of for steak frites at 3 in the morning. 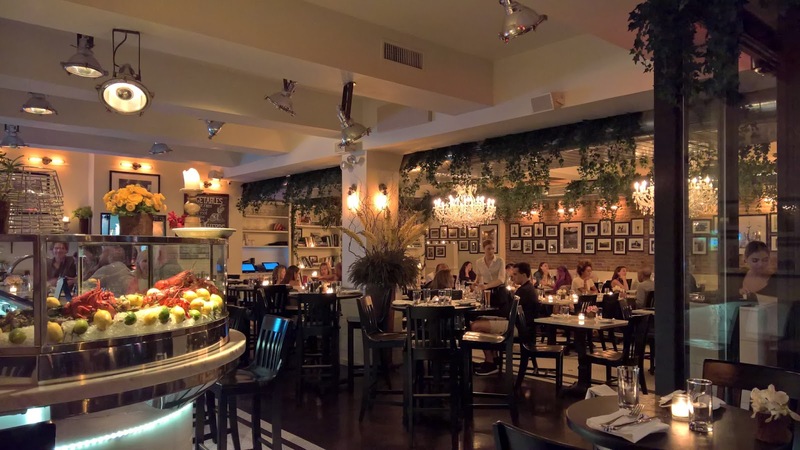 Inside, the decor is classy and modern, without tacky seafood references like nets and mock buoys, instead opting for black and white photos evoking Long Island Sound and the New England coast. I arrived first, as I pretty much always do, and was given a seat while I waited for Dudeman and Shrink. I was surprised at how few people were there at 8PM on a Saturday. Over the course of the evening, more folks came in, but it never filled up. Service was spotty. We started the meal with one waitress, and then they changed tables on us and we got someone new who was not nearly as on the ball. Of course, I didn't come to make friends with the staff. I came for food. I started my meal with what I believed to have been a beet salad. But I was sloppy and didn't read me my words good. 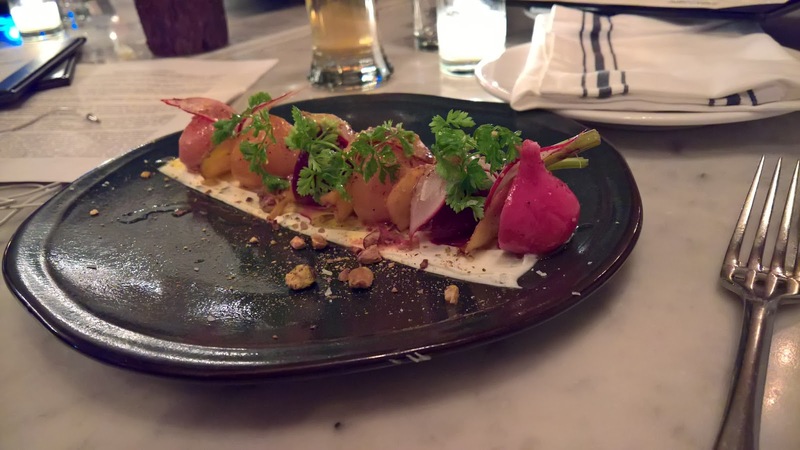 I ordered beets. On a plate. Specifically, Beets with mascarpone and pistachio. And they were delicious. Would I have liked a dish a bit more refreshing and substantial, like that aforementioned salad? Sure. But this was fantastic. Tangy and sweet and nutty. Just a wee bit small. It forced me to chew my food and savor it rather than shovel it into my mouth. 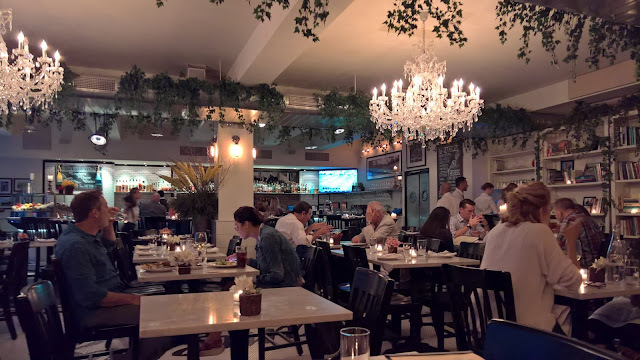 In contrast, Dudeman ordered a bowl of New England Clam Chowder, made with house-smoked bacon and topneck clams and it appeared to have come in a gallon bowl. All kidding aside, it might have been a liter. A huge bowl. Huge and heavy and filling. He passed the bowl around the table for everyone to try, as one would expect when presented with a liter of soup. We all liked it. It wasn't the most amazing chowder I've ever had, but no one complained. As Dudeman went with the traditional seafood shack appetizer, so did he choose when it was time for the entree. No roast swordfish with a sage rhubarb demi-glase. 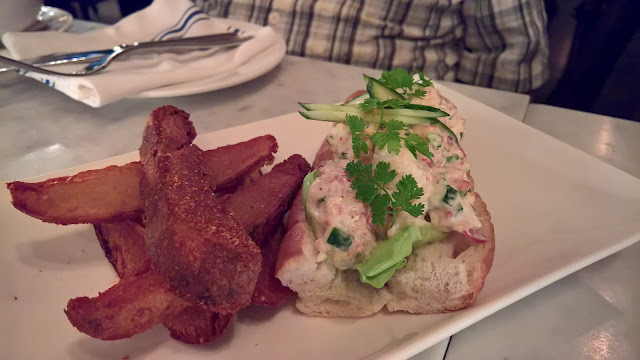 He got the Lobster Roll, served Maine style (ie: warm and mayo) with a side of Steak Fries. Speaking of steak fries, Shrink also ordered a side of them all on her own. My take on the lobster roll was that it was good, but for the money, I'll drive to Red Hook (for the Lobster Pound). My take on the fries was that they were wayyyy too salty and wayyyy too loaded down with Old Bay. Some people love Old Bay, but hey, a little goes a long way. 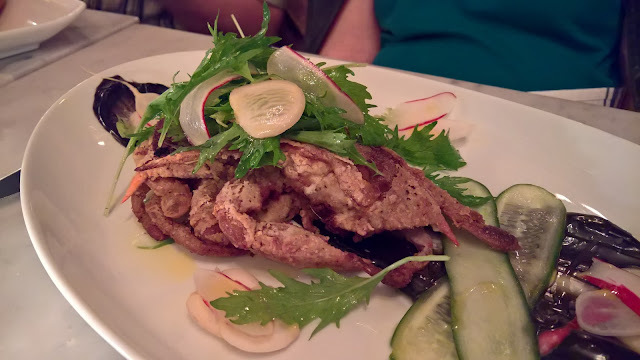 Shrink loves soft shell crab and thus did she order the Soft Shell Crab served with a side of shaved radish and cucumber and pesto and buried under an excessive amount of garnish. She liked it a lot, as did Dudeman. I found it a little bland. I still count the crab at Perry Street as the best available (which it may not be anymore, since I was last there many a moon ago). 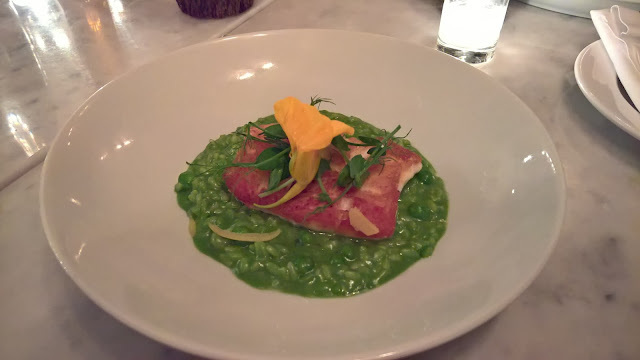 So I might be coming across as a little critical of Farmer And The Fish, but that all gets turned on its head for my main dish, the Nova Scotia Halibut with green pea risotto. I was blown away. It was so good. So light. So flavorful. Almost sweet. It had that perfect center under a crisp crust and it hurt me to share even one bite with others (but I did). The risotto was delicious too and paired perfectly. The only complaint that I have is the size. I wanted it to be about the size of a manhole cover. While we had thought about getting dessert, Dudeman was stuffed from his soup and lobster and Shrink was iffy about the calories after the steak fries. In the end, the flakiness of our waitress gave us our reason to head out without sweets or coffee and save a few bucks. Speaking of bucks, this meal, which consisted of two appetizers, three entrees, a side, and some drinks came to $165 before tax and tip.